Ever since his death in 1970, there's been speculation as to what direction Jimi Hendrix might have gone in had he lived. For every opinion saying he'd have got into jazz fusion (maybe with Miles Davis who at the last minute had pulled out of scheduled sessions) there's the view he would have got into politicised funk-rock to capture the increasingly volatile times. He might have got that cosmic rock orchestra together – an Arkestra-type thing with Gil Evans could have been interesting – or gone back to the blues. Or done soundtracks . . . Such speculation is idle fun, but it's interesting if you put Hendrix against what his guitar-god peers did in subsequent years. Jeff Beck continued his wayward path, rarely holding a band together, making sometimes brilliant records and at others just average, really coming into his own with more consistency in just the past decade. Eric Clapton had highs and lows and then leveled off in the mid Seventies as he stepped away from the “Clapton is God” albatross and made decades of music that rarely fell below a high threshold and sometimes was quite exceptional. 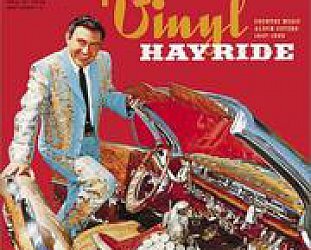 But very little of it – other than obvious highs like the Layla period – came with the visceral and intellectual thrill of his invention in the Sixties. 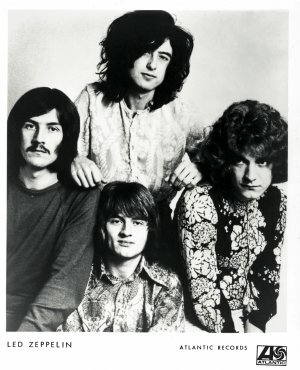 And after the Yardbirds withered away Jimmy Page formed Led Zeppelin in '68 and conquered the world with an amalgam of heavy rock, strange folk and sometimes music which referred to North Africa. What happened after Led Zeppelin ended in the late Seventies however was often much less interesting: soundtrack work, ersatz Led Zepp band/albums with other singers, on-again off-again work with Zepp singer Robert Plant, an almost reunion and then a reunion, remastering and re-presenting the Zeppelin catalogue not once but now for a second time . . . 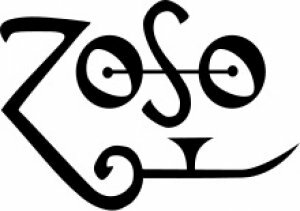 If Plant and even bassist/keyboard player John Paul Jones to some extent – wanted to put distance between themselves Led Zeppelin, Page is the one who seems most wedded to his past. Currently he is presenting the Zepp albums repacked with extra tracks. In 2010, Page was approached by the high-end publishing company Genesis to consider an autobiography. 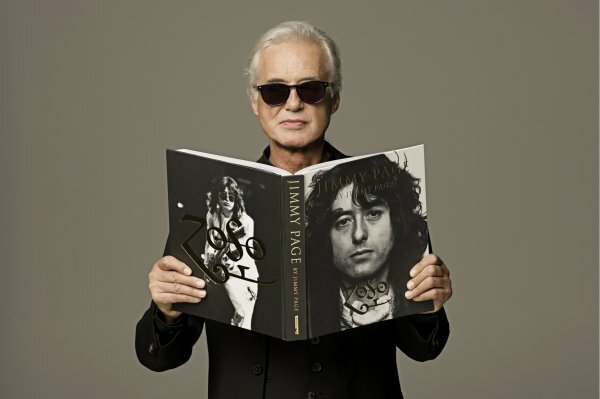 The result was this large format, handsomely bound photographic collection which traces his life from innocent choir boy through his first guitar and early schoolboy bands, session work, the Yardbirds, the short-lived New Yardbirds which morphed into Led Zeppelin, and beyond. 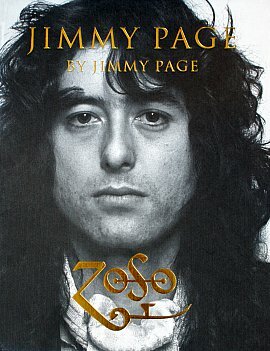 Page offers the barest of commentary but the story is there in the pictures, some beautifully shot, others just slightly fuzzy but atmospheric snaps, a lot of on-the-road life with Zeppelin. There are pages from his much stamped passports, and all of the Yardbirds, New Yardbirds and Led Zeppelin tour dates. The cover of each 512 page book was hand stamped in gold with Page's Zoso logo and came out in a limited edition at around $1500. 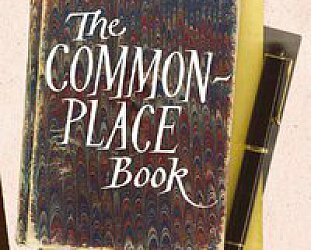 Fortunately for fans there is now a $75 edition (available in New Zealand from Hedley's Bookshop, see here) and it looks equally impressive in its bulk, production and gold embossed lettering. Perhaps for most it will be the Led Zeppelin years which are of interest (and they take up the bulk of the book) but there is an innocent charm in the images of the pre-Zepp years where you see Page and his schoolmates posing in a suburban lounge, then the moody Yardbirds with helmet-haired Jeff Beck. There's a shot in a living room where Page poses and it bears an uncanny but obviously unconscious resemblance to one of John Lennon in Hamburg. He looks impossibly boyish and happy in his first passport photo taken in '64 when he was 20 and going to Berlin for a session but the promo shot accompanying the clipping about his first solo single – She Just Satisfies/Keep Moving on Fontana the following year he adopts the emotionally cooler look of the period. The contact sheets of the Yardbirds are period classics. And the middle half of the book is turned over to Led Zeppelin touring and recording. 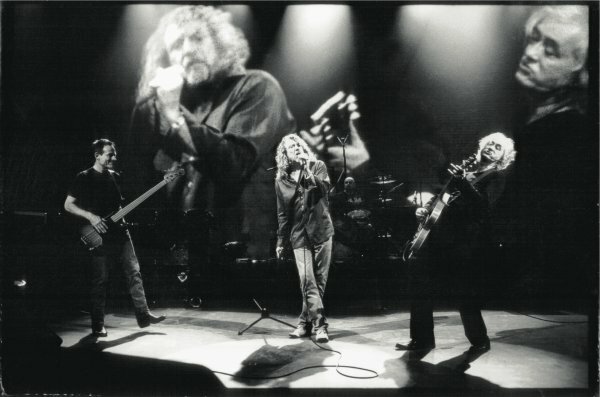 There are dozens and dozens of images – mostly in black'n'white – of an impossibly thin Page playing guitar after guitar after guitar. And sometimes wearing eye-boggling trousers. These you need to see large scale. 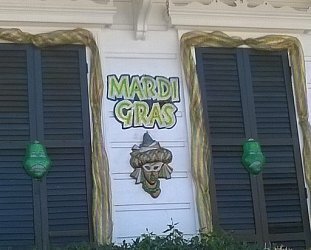 Some of the colour ones are lifted from The Song Remains the Same. The arc here is from small clubs to their own aircraft carrying them from one massive stadium to another. And there post-Zepp years (more live shots, more guitars) and on to outtakes from the cover shot of his solo album Outrider, Unledded with Plant, the OBE, meeting Obama, that famous Zeppelin reunion and a very happy looking Jimmy today . . . who seemed to go completely grey in just one year after 2006. 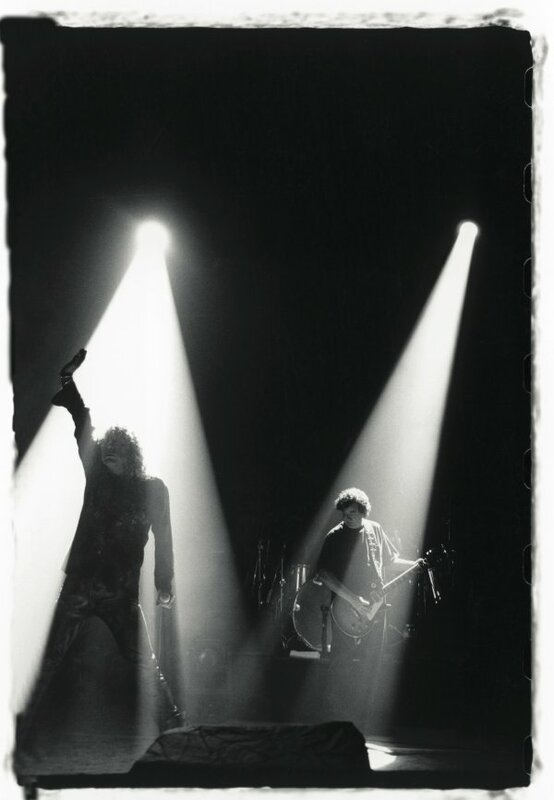 Where the images come up short is in the other Jimmy Page, the one away from the spotlight. Flicking these many photos of him with Led Zeppelin and elsewhere there are few intimate and candid shots, not even that many backstage images, and none of his family or home life. 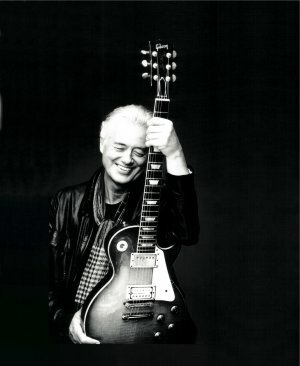 It's as if there is only one Jimmy Page and that's the public figure. 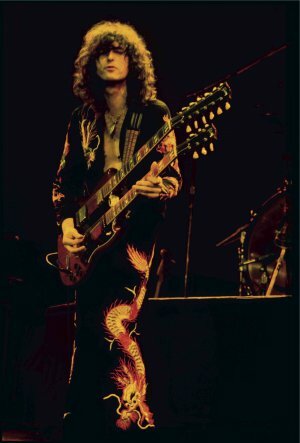 But for Led Zeppelin and Jimmy fans here are page after page of Page as the flamboyant, pouting guitar god with a violin bow in hand or at that famous double-neck. 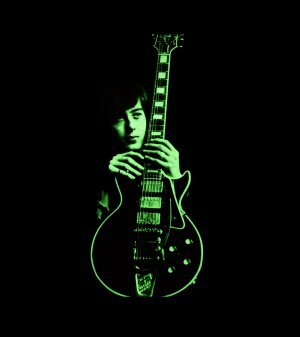 Jimmy Page, the rock icon as rock iconography. So here's a question . . . If Hendrix Jimi were with us today, what kind of picture book do you think that 72-year old would have to show us. 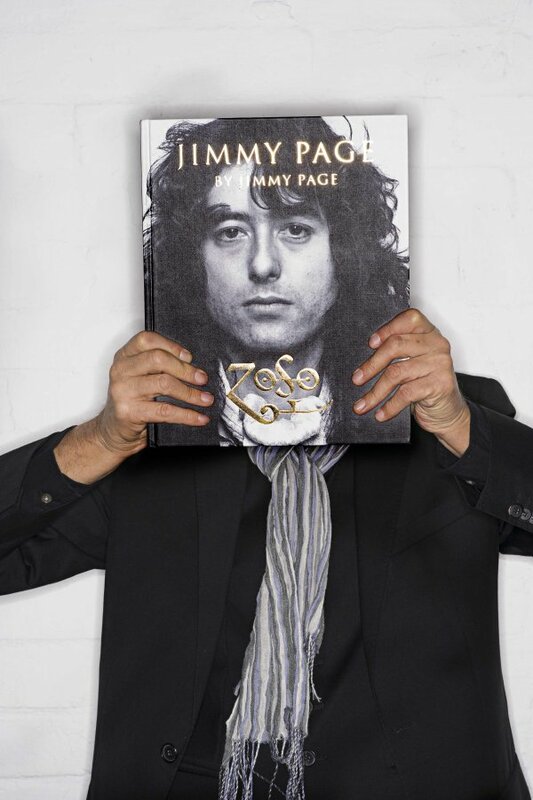 Jimmy Page by Jimmy Page is available from Hedley's Bookshop, Masterton $75. See here. Photos here above and below from the book, used with permission. You can see a video here of Page talking about it with many images from the book.